Andrew Bossie, president of Mainers for Accountable Elections, speaks with news reporters outside the State House on Tuesday as the organization launches the Yes on Question 1 campaign, which supports campaign finance reform. 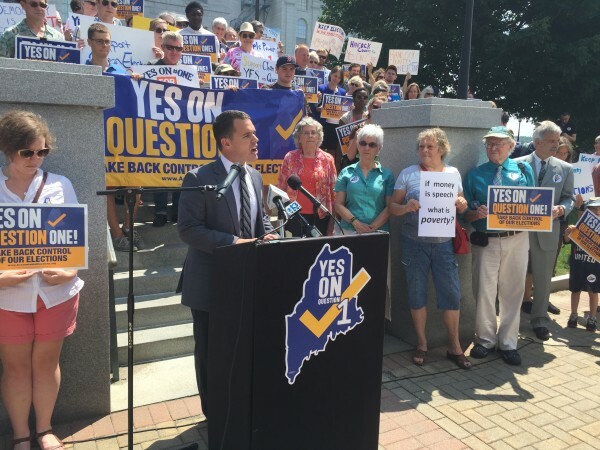 Dozens of volunteers and activists turned out Tuesday at the State House to kick off the Yes on Question 1 campaign, spearheaded by Mainers for Accountable Elections, which supports campaign finance reform. 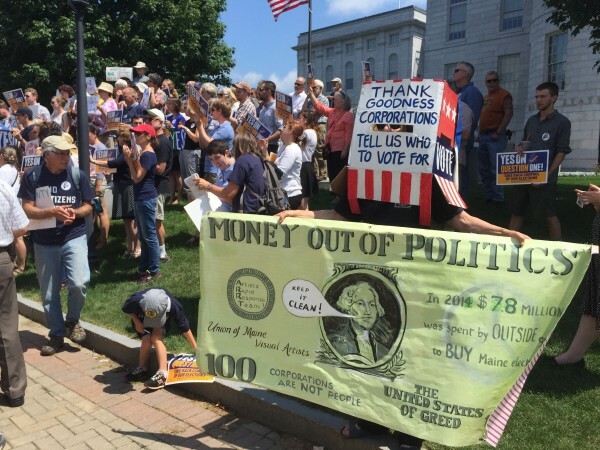 AUGUSTA, Maine — Supporters of broad campaign finance reform officially kicked off their referendum campaign Tuesday during a rally outside the State House. Question 1 on November’s ballot will ask Mainers whether to adopt myriad changes to Maine’s campaign finance and election laws. The “yes” campaign is being spearheaded by Mainers for Accountable Elections, a coalition of roughly 30 groups including progressive advocacy outfits, religious organizations, labor unions and others. The proposed reforms include increased funding for publicly financed candidates, a new requirement that third-party political advertisements disclose the top three donors who funded the ad, and stiffer penalties for groups that flout Maine’s campaign ethics laws. Proponents, who rallied several dozen volunteers and supporters at the State House, said Mainers are tired of secretive, big-money interests dominating the election conversation. “It’s wrong when many Mainers, including all of us here, don’t even know where the money is coming from to pay for the ads we see on our TV, our radios and in our mailboxes,” said Sen. Roger Katz, R-Augusta, who is a longtime proponent of Maine’s Clean Elections Act. The group Mainers for Accountable Elections hopes to strike while dissatisfaction with big money in politics is high. At roughly $19 million in the governor’s race alone, spending in Maine elections smashed records last year. Marilyn Canavan is a former director of the Maine Ethics Commission, which enforces the state’s election laws. Twenty years ago, she was among those responsible for writing the state’s Clean Elections Act. The campaign finance reform effort is the only ballot question expected to be decided in this November’s election, aside from bond questions approved this year by the Legislature. So far, no group has formed to oppose Question 1, but Andrew Bossie, executive director of Maine Citizens for Clean Elections and president of the Yes on 1 campaign, said it will come in time. The referendum, if successful, would require the Legislature to come up with $6 million in savings by eliminating one or more tax expenditures — programs that give tax breaks to businesses. Under a law passed by legislators this year, the Office of Program Evaluation and Government Accountability would be required to start assessing tax expenditure programs on the books. The law is one of 65 in disputed status as Gov. Paul LePage claims he vetoed the bill, but the Legislature says he missed his chance to do so.